One must always expect surprises when researching family history, because you just never know what you might uncover. 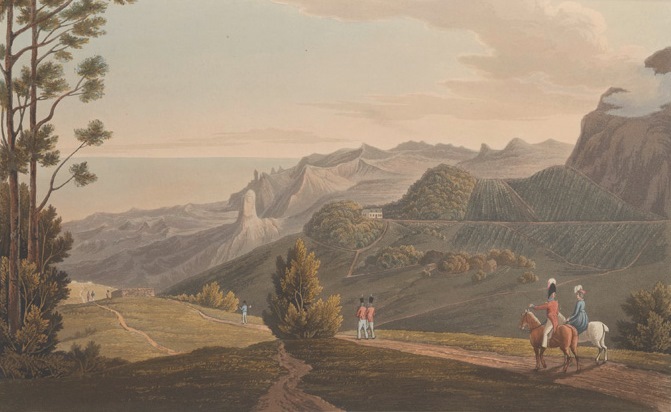 When researching my paternal ancestors, I discovered that our family had ties to one of the most remote places on the planet: the island of Saint Helena. Made famous as the location of Napoleon Bonaparte’s second exile, Saint Helena is a rocky, volcanic island located in the South Atlantic Ocean between South America and Africa. The current population of the island is just over 4,000 people. My ancestor Charlotte (Sears) Legge was born there, in the town of Jamestown, in 1808. So when I learned that our family had ties to such a remote place, naturally, I had some questions. Why were they there? And how did they end up in Massachusetts? Saint Helena was settled by the English by 1650, and it became a port of call for the British East India Company. Eventually, the island became an important half-way point for ships traveling to China and India in the seventeenth and eighteenth centuries. But the island is most famously known for Napoleon Bonaparte, who was exiled to this remote locale from 1815 until his death in 1821. William and Charlotte (Sears) Legge, my ancestors, named a son William Napoleon Legge in honor of the Emperor. 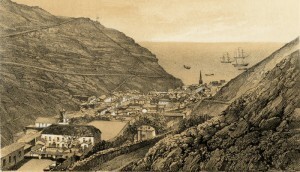 In 1821, after Napoleon’s death, the population of the island decreased, as Saint Helena became a less popular port of call for merchants, further increasing the island’s isolation. Many residents left for better opportunities, some immigrating to Cape Town, South Africa, and others to the United States. I have yet to uncover the reasons why my ancestors settled in this far off place. They could have been early English settlers of the island, merchants, or members of the British military. Hopefully, with some more research and a little luck, I can discover their reasons for settling at Saint Helena. After the death of her husband, Charlotte Legge left Saint Helena for Edgartown on Martha’s Vineyard, probably seeking a better life for her family in Massachusetts. In the 1860 U.S. Federal Census, Charlotte was listed at Holmes Hole in Tisbury with six of her children: William, Richard, Lewis, Jemima, Louisa, and my great-great-great-grandmother Isabella Agnes Legge. Martha’s Vineyard and Cape Cod were popular destinations for natives of Saint Helena. Late nineteenth and twentieth century census records reveal many familiar names in Tisbury, New Bedford, and Falmouth, and in Fairhaven in Bristol County. As mariners and merchants, these coastal communities would have been a natural fit for these islanders. Some of the Legge children married and remained on Martha’s Vineyard, while others moved to Cape Cod. My great-great-great-grandmother stayed on Martha’s Vineyard for the rest of her life. Her first husband died during the Civil War, and she later married my great-great-great-grandfather, Manley S. Smith. As for Charlotte, after a lifetime spent on islands, she eventually settled in Fairhaven and died there of typhoid fever at the age of eighty. I hope one day to learn much more about the Sears and Legge families of Saint Helena. For now, it’s an interesting – and unexpected – piece of my family’s history. Fascinating. I’ve found that ancestors of mine from New Bedford, Massachusetts, also lived in Pernambuco, Brazil. Henry Forster was a merchant in New Bedford and Pernambuco. Several family members are buried there. I also found one family in Las Palmas, Liberia, where they went as missionaries before the Civil War. Seems they were just as adventurous as people today. Jennifer, One of my Atherton cousins married a Forster: Constance Atherton, daughter of Henry Lee Atherton, U.S. Consul — evidently in Pernambuco — married George H. Forster, later of New York, in 1867. The Foster genealogy calls George H. George Henry Forster, son of Henry. It sounds like it could be the same family! You must be in my genealogy. George H. Forster and his brother and Frederick Prentiss Forster, my great grandfather, were law partners in New York City. My grandfather was Henry Forster, son of Frederic and Edith Allen. I have George and Constance (Atherton) Forster’s sons as Henry Atherton and Frederic Everard Forster. Is your Frederic Prentiss Forster George H.’s brother? I should add that I went to school with Tim and Ham Forster. Yes, he is George’s brother, My mother was Sheila E. Forster Morris, Henry’s daughter and sister to Henry, Bayard, Chris and Hamilton. Only Chris and Ham are still living. Chris has a son named David. David was my classmate — small world! you NEVER know who you might dig up from the annuls of your family history. I joined the local DUP (Daughters of the Utah Pioneers) here in Reno, NV and found about three families of relatives that I had NO idea about ever even knowing, let alone meeting…. My step-father’s family was John Balch of the Four Planters of Beverly, MA and my real father’s family were the John Hill family of Dorchester, MA….. both of them settled in their respective settlements between 1624 and 1630, and both of them came from Taunton, Somerset, England and lived within about 7 miles from each other for about two hundred years in England and 55 miles from each other in MA. They each had family members that had married into each others families, so I am related to each by marriages and blood. I always felt a bit odd about my relationship to my Step-father’s family, and I knew more about them, as I grew up with the Balch family and NAME until I started finding that I was really a Hill (when I was 17 years old) and that there were many ways that they had known each other way back even before they both came to America in the 1600’s. Maybe I have a few of you as relatives also….. the Balch’s and the Hill’s were very prolific families and each had MANY children. From the Balch side, I have a relative named BiGod out of Norway, way back about 600 BC. I haven’t been able to find much on him though. IF any of you out there in the cyber world know about him — please contact me. My Mother was from a Clayorne, out of Virginia. who arrived in America about 1618, at Jamestown, I have hit a roadblock about the mid 1700’s on her family while trying to connect to the Gov of Virginia, but supposedly, my Grandfather was related to the first Gov of Lousiana. You might check the whaling routes used by Martha’s Vineyard/Cape Cod whalers. If they went near or to Saint Helena it might explain why so many ties exist.